As regular readers of my blog (if there are any) will know, my literary preference is most definitely for the novel, and other genres are comparatively underrepresented in my reviews. You will find the odd novella, a smattering of short-story collections, even the occasional non-fiction text if you look long and hard enough. However, apart from a rather irreverent look at an Ancient Greek classic, poetry has not had a look in on Tony’s Reading List, leaving a small, poetically-shaped gap in my online world. I know that makes no sense – now you know why I’m not big on poetry. 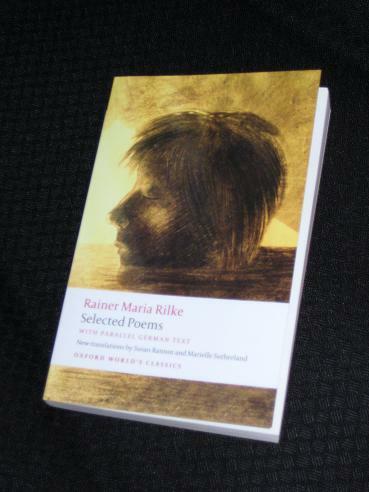 Rilke is one of Germany’s most famous poets, and the above-mentioned selection is a hefty one, including poems from the whole of his career, from his first published sonnets to the later, meatier epic poetry of The Duinese Elegies and The Sonnets to Orpheus, and on to his later, shall we say, more interesting work. German is a language which seems to lend itself well to poetry, the ebb and flow of the words and the formal sounding rhythms creating soothing patterns of language (well, to my ear anyway!). Those of you with some knowledge of German will, no doubt, be comparing the two versions above, and it immediately becomes clear that while translation is always a rather inexact science, translating short lyrical poetry is up there with splitting the atom. To preserve all nuances while adhering to both rhythm and rhyme must, technically speaking, be an absolute nightmare, and the two translators of this version, Susan Ranson and Marielle Sutherland, do a sterling job. However, the translation will never quite capture the essence of the German. while the lion bares its teeth and tongue. It’s easy to see that the meaning has been altered slightly to fit the rhythm in the first line, from Junge (boy) to ‘a boy, quite young’, while in the second line mit der kleinen heißen Hand (with the [his] little, hot hand) is changed to ‘with sticky hands’ – accurate, but perhaps missing the possible connotation of ‘eager and excited’ which the German contains. Also, in the final line above, ‘now and then’ can’t compare with the assonance of dann und wann, nor does the repetition of ‘white, white’ (to catch up on syllables) quite match the simple German weißer. However, when we come to the longer epic poetry of The Duinese Elegies and The Sonnets to Orpheus, the translators really come into their own. The lack of rhyme gives them more freedom to adhere to the meaning and rhythm, and it is here that the non-native speaker (and possibly many native speakers too!) are grateful for any help the translators – and the excellent notes at the back of the volume – are able to give. When faced with pages of dense imagery, it is easy to tune out to the overall message, and with poetry, unlike with a novel where missing an idea or two dann und wann is not such a big deal, that pretty much defeats the object. Thanks for the heads up, on this one, I definitely want this & love Rilke, altho my German's not good enough for the original, it would be nice to refer across in this one. also hoping this slight addition of poetry is the start of something bigger. Stu – I think if you were wanting to get something by Rilke, this would be a good choice. Having the original there is a definite plus.